TruStrip™ STS technology is similar to the time-tested, filter paper-based sample collection method, but incorporates several unique features that make it smart, efficient, tamper-proof and cost-effective. The key design features and functional benefits will help understand what makes the TruStrip™ STS technology truly unique. Pre-calibrated absorbent pads - At the heart of each TruStrip™ strip is an absorbent sample collection pad that ispre-calibrated to retain a very specific volume of liquid - without the need for any measurement device such as a pipette. The material that makes up the pad is solvent resistant, chemically inert and does not interact with the sample that is applied to the pad. 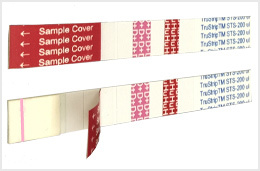 Sample protection - Every TruStrip™ strip has a hinged sample cover tape that protects the sample that has been applied to the pad from any accidental contamination orcoming into contact with samples on other strips. Combinatorial color tags - TruStrip™ strips are coded with a colored tag with codes that clearly indicates the species (e.g., Hu=human, Mo=mouse, and Bo=bovine/cow etc.) from which the sample is being collected on the pad. This strategy could easily involve applying additional unique color tags that serves to capture any other parameters of significance such as sample type (e.g., serum, plasma etc.) or sample collection location, as desired.The strip also has a tag (+D) if sample tracking dye has been applied to the sample pad. The dye indicates whether an unused strip has been tampered with or accidentally exposed to a liquid sample. Upon coming into contact with any liquid, the dye (pink color) diffuses along the surface of the absorbent pad, thereby indicating potential tampering or exposure to unknown sample. The tracking dye enables to monitor the sample recovery efficiency by measuring the amount of the tracking dye in the recovered sample solution spectrophotometrically. When working with clear or colorless samples, the diffusion of the tracking dye across the length of the pad would be definitive indicator that the colorless sample has been collected on the absorbent pad. Shipping of samples collected on strips is highly cost-effective as there is no need to rely upon expensive refrigerated methods of shipment that is typical of samples stored in tubes or vials. The ability to collect samples in a quantitative fashion without the need for any measuring devices such as pipettes makes this technology ideal for field applications and other sample collection situations such as forensic evidence collection, as an example. The known sample loading capacity of the absorbent pad allows for the correct dilution factor to be applied to the sample recovered from the pad when performing some types of diagnostic assays with the sample. The ability to code and decode sample type, sample source, and other parameters via the use of simple, yet unique combinatorial color tags makes it highly efficient and convenient to catalog and archive samples. All the above unique design features and the functional benefits makes the TruStrip™ STS technology Smart, Efficient, Tamper-proof and Cost-effective.